I received an email from my daughter’s birth mother before Christmas that sent a shiver down my spine. It was a short email, but she asked, “How is my little princess doing?” In an instant my heart raced, my maternal hackles shot up and I became Hulk-Mom. She my princess, I thought protectively. It never occurred to me nine months earlier, that we didn’t just adopt our daughter into our lives, we adopted her birth family as well. But over the next day or so my hackles lowered and I allowed my thoughts and feelings to settle. This is our first child and our first adoption; and it’s an open adoption, meaning we’ll be in contact with her birth mom through letters and photos for the next 18 years. Because we live overseas we won’t be able to have the get-together-for-holidays relationship some adoptive families have, but I respond to any request I get from her for updates and pictures in addition to the biannual ones I send. I love the idea of open adoptions. I love that as our daughter grows up, we’ll be able to show her pictures of us meeting her birth family for the first time; pictures of all of us together after she was born; we’ll be able to share the emails and letters we sent back and forth over the years; and if she chooses, we can arrange a meeting when she’s ready. My sincere hope is that as an adult she can have a relationship with her entire birth family. Open adoptions are relatively new. Thirty or forty years ago, it was more common to have closed adoptions, where neither parents nor birth parents knew anything about the other. Then only through a lot of paperwork and legal wrangling could the files be eventually unsealed; and even then, it’s not always a guarantee. I have adult friends who were adopted as infants in the 60s and 70s and are still unable to unseal their own files to learn anything about their birth parents. From the start, my daughter’s whole birth family was involved in the difficult decision to give up the baby. We were told that they all helped choose us from a stack of hopeful wanna-be parents. I remember being so scared to meet them, knowing that at any point prior to the birth, and including 48-hours after, they could change their minds. But when we met them just a few days before the birth, they were loving and kind and seemed genuinely grateful to have found us. And I love the fact that they all still care how our daughter is doing and want to remain in her life; but while I love it in theory, I’m finding that it’s something I need to fully embrace and accept in my heart, as well. For all the paperwork swarms, fingerprinting, notarizing hurdles and emotional minefields we traversed throughout the adoption process, there was never any preparation for how to deal with our newly extended family. 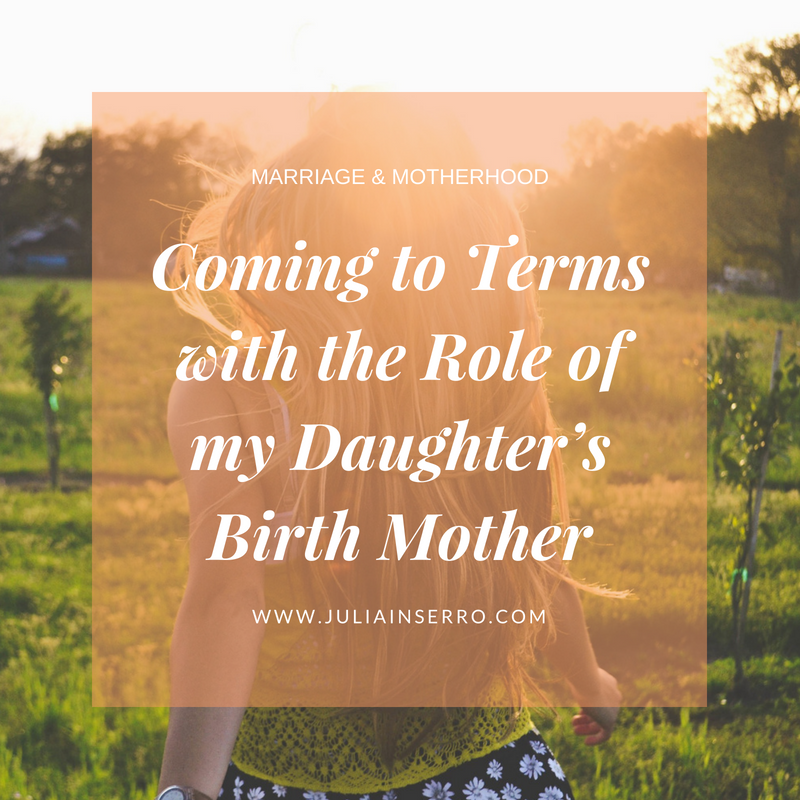 I’d heard from other adoptive families about issues or blessings they’d addressed in their various relationships with the birth families, but it wasn’t until our daughter was almost nine months old, and I got this email from her birth mother, that I fully realized that her birth family was going to be in our lives forever. But with all my hackles back in place, I finally understood the full repercussions of this: my daughter will always have two mothers, both who love her dearly. Her birth mother loved her enough to know that she wasn’t able to raise her in the way she wanted, so she sought out a family desperately wanting a child, which was us. And I, as her mother, knew in my heart my daughter was out there and I was willing to wait forever until she arrived. A week or so before Mother’s Day this year, we got another email from her birth mom. She thanked us for the birthday card we’d sent, and then added, “Thank you so much for taking care of her and for loving her so much. I know you are the best parents in the world.” No hackles this time, just genuine love and gratitude for this amazing woman who gave me the most precious gift: motherhood. And in return, we feel truly honored to welcome them into our family for countless Mother’s Days to come.